I am a big Trader Joe's fan. I posted a more detailed reply during the first upgrade that got lost, and now I'm too lazy/forgetful to repost. Anyway, I hosted Mother's Day dinner at my house last night. 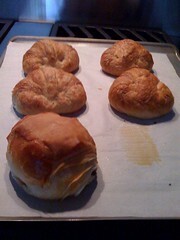 I used the Artisan puff pastry from the freezer to make to make Chinese chicken turnovers and Portuguese egg tarts. They were a hit! The puff pastry is really nice to work with and very delicious. It was moist, buttery and flaky, but not overly flaky that there was a shower of crumbs everywhere. I like that they are sold as whole sheets as opposed to a folded sheet. This is much better than another mass produced puff pastry found in your big box grocer. I have no use for Trader Joes. No decent meat, & no decent vegetables are the main reasons I have zero use for TJ's. Also I am not interested in frozen prepared foods(or prepared foods in general), frozen fish, or the things TJ's seems to specialize in. I'm not conveniently near a Trader Joe's and I have no car so I don't go often. But every once in awhile I feel a need to go to a different fricking grocery store for some things. I think the Chicago area has such lousy grocery stores and when I have a desire to go somewhere kind of different, TJ's fits the bill. I end up spending $50-$60 mostly on snack/little meal options. I think their vanilla wafers with specks of vanilla bean are tasty --and their version of sandwich cookies are good. I'll pick up King Arthur flour, Nathalie's Orchid OJ and some parmigiano. They're the only place i've found where I didn't feel rather ashamed for buying Boursin ($4 versus $7 -- i love Boursin but its priceiness always makes it seem like such a guilty pleasure. Most of the things i buy there I would rarely buy at a Jewel/Dominick's. In other words, I like TJ's tubs of cookies but if I was doing my regular shopping at a Jewel, I'd never buy a box of Nilla Wafers -- I'd go without. I love their flowers and I'm not quite sure how they do it, but TJ's always has a kind of festive atmosphere to me. Maybe it's because I don't go that often but I always smile in a TJ's. There's something quaint about it to me. I'm sure that sounds crazy to you but it's just sort of treat for me. When I walk into a Jewel -- it's all business and a push to get the shopping OVER with. TJ's, I like lingering in. I also like their haricots verts. Best frozen green beans ever. Decent coffee, cheap but decent wines and the occasional Ritter Sport bar. I do think the baked items look rather lame -- which is why I've never bought any of them. But Dominick's has lame baked goods too so that's not much of anything new. I find Trader Joe's to be a great store if you're a lazy cook like myself. There's a lot of easy meal options there. They also have a sporadic collection of organic foods, so I kind of hunt around for good options. I really don't mind their meat there -- one thing I like is that they carry organic ground beef, which I have trouble finding, even at Whole Foods, sometimes, and it's slightly cheaper than when WF carries it. I also buy the seasoned pork loin, and seasoned lamb tips or lamb loin. All of these items can be thrown on the grill, steam or roast some vegetables, and voila! Dinner for Dummies. Then there's always the extra impulse buys I end up with. Some things look a lot better than they end up being, i.e., the garlic ranch fries, I think -- I hated those. And I recently bought buffalo-style wings that you bake in the oven. Those didn't end up working because the buffalo sauce was already on them and they came up soggy and not-so-great. One thing I have noticed: their wine prices seem to have gone up. I used to go looking for pinot noir there because they usually had some good ones cheaper than what I could get anywhere else -- but now I can't get a decent one there for under $20. Eh? Maybe I'm just being cheap, but no thanks -- I'll just go to Sam's Club, or even WineStyles. Yesterday I was at Trader Joe's and was in the mood for nuts, so I grabbed some cashews, almonds and blister peanuts. Don't really grab shelled peanuts too much, and no idea why I grabbed these, but they are the best peanuts I have ever had. Guess the "blister" comes from soaking them in water prior to roasting, which makes the peanut "blister" This makes them super crunchy, and they have a great roasted flavor that reminds me of peanuts in shells. Well worth the $1.99 for a pound. Both stores stocked exactly the same items, so it was not an out of stock issue. They seem to have gone with wider varieties of crowd pleasers like cashews, but cut down the variety of other products. I will have to scramble to find reasonably priced alternative sources. Yea I was disappointed to learn that they stopped carrying hazelnuts last year. I have seen the figs, but it was a couple of months ago. I am shocked that they have stopped carrying just dark or golden raisins - I guess it's been awhile since I've had to purchase them. Have you tried asking about it at customer service? They seem to take those requests pretty seriously. Months ago I asked to be notified when something came back in stock. It took a while, but just recently I got a call telling me that they were carrying my requested product again. Again, though, TJ's follows the commodity markets looking for deals and when things go up in price, they choose something else. I've noticed both new things (whoever saw mangosteens there before?) as well as old ones being absent. So I think they don't have this stuff because it's costing them more these days. While I agree with the general thesis on how TJ's operates, in this case I think it's something else. Why carry 6 types of almonds but drop one. Why carry mixed raisins but not regular. Why salted pistachios but not unsalted. I think its an attempt to simplfy their inventory and carry high turnover items. They also are doing a LOT more TJ branded items, and a lot fewer other things. I used to be able to get fig jam and quince paste there - no more. Have to go to Whole Foods for those. They are very good about follow up calls - I've made a point of always asking when I can't find a product & it does pay off. The staff usually also can tell you whether they are waiting for stocks or its a product they are discontinuing. A couple of items I liked disappeared because their suppliers stopped carrying the item - for really popular things TJs will try to find an alternative supplier & they will let you know this (that happened with the rice stick noodles I liked; it came back as a TJ brand item a few months later). Also if its something they think isn't selling well, griping can bring it back - they stopped carrying my favorite tea (discontinued it) & apparently enough people bitched at them (including me, repeatedly) that 3 months later it was back. Rickster - I picked up a bag of golden raisins at the Lincoln Ave location Friday morning. Since this seems to be the de facto "products I love at Trader Joe's," I wanted to pass along the name of a great new product that I discovered: Trader Joe's Tomato Chutney. chgoeditor, you were perhaps in the store when I was, and they were giving away tastes of tomato chutney heated and mixed with goat cheese. (with crackers to dip in it).. very yummy. This is truly excellent tomato chutney, I have three bottles sitting on my shelf now. I nearly always add ingredients to anything that comes out of a jar, but this chutney is perfect as is. I am in the vicinity about every 6 - 8 weeks, and stop in if I have time. I mostly buy odds and ends that are extensions of my usual shopping list-- ie, not things I really need. Favorites include the spicy pecans (yum) and the triple ginger cookies. I bought a lot of dried fruits and candies for Christmas stocking stuffers last year. (This is also good stuff for college care packages.) I was reminded by the comment about service-- I asked a staff member about the difference between two types of dried cherries, and he asked someone else, and when they didn't know, he ripped open two bags on the spot and let me taste. That to me is first class service. I would actually have guessed wrong and bought the cherries I didn't like as much. I really like the TJ's milk. I get the 2% -- it actually tastes like real milk instead of the nearly tasteless stuff you get other places. tcdup wrote: I really like the TJ's milk. I get the 2% -- it actually tastes like real milk instead of the nearly tasteless stuff you get other places. Could it be it's pasteurized at a lower temperature? A clue would be if the expiration date is within the next week or so, rather than the two months from now (or whatever) that seems to be getting more typical. The only way milk can stay consumable for that long is if its pasteurized within an inch of its life, which also (it's my understanding, sadly) denudes milk of flavor. When we were in England earlier this year, we both kept noticing how much the milk tasted like milk used to taste here. We thought it was because it had to travel less distance to reach us (England being a smaller country), but our guide suggested it was the lower pasteurization temps that are the norm there. Anyway, just curious what your carton of TJ milk says on it re that. riddlemay wrote: Could it be it's pasteurized at a lower temperature? Not likely. It's probably sourced from a local dairy through a standard HTST pasteurization process, then put in the TJ's private label. Should be easy to figure out where it's processed - by law, there must be a plant number on the package. If it starts with 55, it's a Wisconsin plant; if it starts with 17 it's an Illinois plant - the following numbers point to specific plants. It's pretty likely TJ doesn't have enough volume to support a plant of its own, or even to get custom pasteurization from a local dairy (not even sure the FDA would permit it), and the economics of transporting fresh milk over long distances (unless ultra-pasteurized) just don't work. Last edited by nr706 on July 9th, 2009, 11:41 pm, edited 1 time in total. Thanks. I noticed last week that the store had restocked golden and black raisins, but not any of the other items. I bought most of what I needed at the Home Economist in Skokie. The primary appeal for me is that many "staple" items for me -- cereal, orange juice, peanut butter, milk, and assorted snack foods are both cheaper and better quality than most anything at the local Jewel. Whole Foods is certainly better, quality-wise, but their prices are exorbitant at times. Lykorian wrote: The primary appeal for me is that many "staple" items for me -- cereal, orange juice, peanut butter, milk, and assorted snack foods are both cheaper and better quality than most anything at the local Jewel. Lykorian - While I definitely know what you MEANT, that's not really saying much at all. Jewel (regular) prices are horrid compared to the grocery stores I frequent the most. I'm a fan of Tony's Finer for peanut butter, orange Juice, and milk. Jewel can put out a better sale price on big brand cereal probably for being a bigger quantity buyer. Not sure why they can't do the same for OJ, or Milk, or PB. Sour Cream too. Who pays more than 99c for a 16oz container of Sour Cream? Not From Concentrate OJ tops out at 2.50 a carton for me. Seems like Jewel's best sale price is 3.00 these days. From Concentrate OJ tops out at 1.50 for me. No reason to pay more than that when other grocers will have it, and they are just as convenient to get to. They just don't have the advertising power to hammer it into everyone's mind that they have the best price like Jewel does. FRESH to your FAM-lee from Jewel! i am not a big fan of traders but these were fantastique! started my year off right with le pain au chocolate and plain croissants . i always wanted to buy the ones sold by williams-sonoma, but i read that these are from the same source, jean-yves charon of galaxy dessets in california. proofed them overnight and popped em' in and 20 minutes later, mmmmmmmm! thanks for the tip -- one of those would be really tasty about now! guessing they're sold frozen?? I also served the chocolate croissants , but mine were more of an oblong shape. They do need to sit out all night, so just beware that they don't go from the freezer to the oven. These are a very rare treat, they are so good. Yes, these are sold frozen, 4 to a package and around $4 IIRC. They are wonderful. We have had them a few times now..wonderful on a Sunday morning with a cup of strong coffee and the paper. You have to put them on a cookie sheet and let them rise overnight. Oh, and they are by the desserts, not the breakfast items. I also picked up a box of chocolate covered caramels with sea salt over the holidays. They are/were a seasonal item and we cracked open the box 2 days ago. I told my husband to hide the box from me--they are a wonderful little treat and very addicting. I stopped in Trader Joe's yesterday to get my dark chocolate covered raisins (that's the one thing they have that I'm addicted to - much cheaper than anywhere else) and decided to also try the chocolate croissants. Loved the convenience - I let it rise on my counter all day then ate it for dessert - but thought the baking instructions a little strange. They tell you to bake them until the tops are very brown or else the croissants won't be cooked through, but it made them too crunchy and less flakey. Don't get me wrong, I'm still a fan and will buy them again, but there was definitely a difference between these and fresh. CM2772 wrote: I also picked up a box of chocolate covered caramels with sea salt over the holidays. They are/were a seasonal item and we cracked open the box 2 days ago. I told my husband to hide the box from me--they are a wonderful little treat and very addicting. I picked up a box of the regular, non-chocolate-covered caramels with sea salt over the holidays. They're not as good as the ones I've had from France, but they worked really well in this super simple recipe for roasted pears and apples from Chocolate & Zucchini, which I've made a few times as a lighter, warm, wintry dessert. I upped the number of caramels by a few.